Trick or Treat? Makati closes off Paseo de Roxas for another culinary Street Meet! Scary ghouls and goblins, jack-o-lanterns and witches will descend upon Paseo de Roxas, promising not just tricks but also lots of treats at the Makati Street Meet this 23rd of October. Makati will once again prove its distinct city vibe and vibrant community spirit as it transforms an iconic business avenue into a culinary street meet. A strip of Paseo de Roxas will again be closed as Make It Makati hosts its second Street Meet, bringing together gastronomic delights, a kiddie fun fair and great entertainment for all. 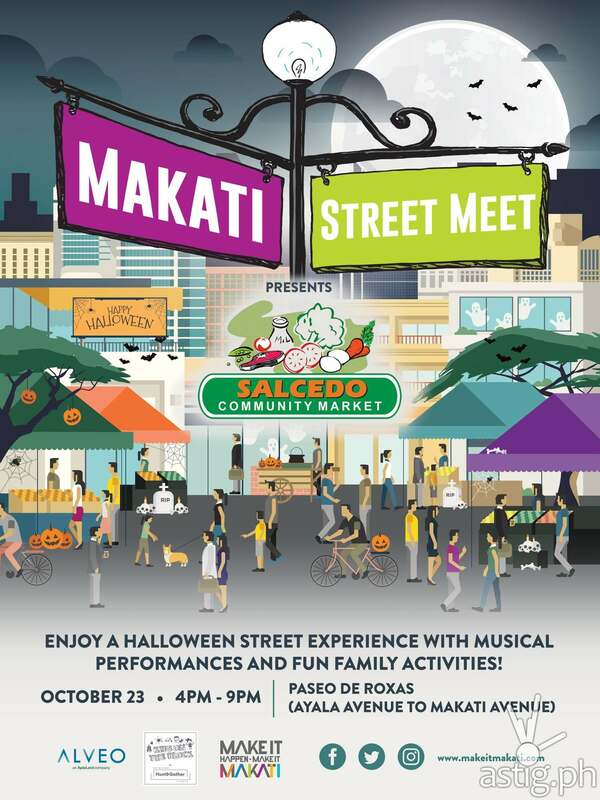 Amidst the trick and treating, musical performances and family activities await everyone at the Makati Street Meet, which promises to delight everyone with spook-tacular experiences and lots of really good food. Building on the community spirit and the district’s fun vibe, the Halloween Street Meet brings together residents and their guests in a street activity the Makati way. The Street Meet will feature a curated selection of vendors from the famed Salcedo weekend market, a much-loved Makati tradition. Nearby are the iconic landmarks Makati has been known for, now serving as the background to a fun Halloween street experience. That’s because from 3PM until 9PM, Paseo de Roxas, the stretch adjacent to the Ayala Triangle Gardens, will become a giant Halloween village—frighteningly fun yet a secure, pedestrian-friendly playground for the young and young at heart. Children and their parents can run from their homes straight to the event grounds in their Halloween costumes, enjoying the benefits of living at the center of fun and dynamism. “Halloween is always fun for kids, so we brought this tradition to Paseo de Roxas, and made it even better. We’d like the Makati community to enjoy this time-honored activity, right here where they live,” said Shiella Aguilar, Project Development Manager of Makati. Halloween party goers can look forward to a wide range of activities at the Spooky Halloween Town featuring a Hideous Parlor, Masquerade Ball, Wishing Cauldron, Houdini’s Escape Challenge, Magic Monster Photo, Mini Monsters’ Pets, Imaginary Beasts and many more by Hedcen. There will also be an Outdoor Classroom by PlayWorks, Decoupage by LaPomme and an exhibit on the Tungtong River Conservation at the Ayala Triangle Gardens. For those who simply want to enjoy the good food and lounge around, an Earth Music Jam and other musical performances await guests throughout the evening. An assortment of treats can be enjoyed from Salcedo Market vendors who will serve up their signature offerings– baked goods, artisanal delights, hometown favorites, and the most luscious concoctions whipped up by homegrown chefs and foodies. Participating food vendors are Monster Burger, Elbert’s Sandwiches, Saikuro Steak, La Cuisine, Old Fashion Tapa House, Chicken Inasal, Jiro’s Lechon, No Fat No Glory, Llanes Farm, Delicane, The Commissary Kitchen, Authentic House of Curry, Merry Moo, Gostoso Piri Piri, Milea Bee Farm, Rafik Shawarma, Don Churro, Easternbloc Inc., Manong’s Bagnet, Michelle’s homemade putong ube atbp., Rita’s Kitchen, Bersi Gyros Shawarma, Tuna Town seafood place, SCM Beverage, Stanford Shaw Brew, Cheryl’s Cuisine, Margarita’s Paella, Antipolo Delicacies, Pamangan, Bread Basic, and Haici Food Services. The Makati Street Meet promises fun and excitement and the street vibe that is distinctly, uniquely Makati’s—the locus of the best food, entertainment and lifestyle offerings. This Halloween Street Experience will also showcase the city’s efforts to increase walkability in the area by providing fun-filled activities that encourage people to actively use its streets. “The Makati Street Meet is another great way to let people discover that there’s lots to do and enjoy just by walking and exploring the streets of the city,” said Aguilar. The Makati Street Meet is supported by Alveo and Hunt and Gather. Admission to the street party activities is FREE on a FIRST-COME, FIRST-SERVED basis. For more information about the city that makes it happen, visit www.makeitmakati.com or like and follow Make It Makati on Facebook, Twitter, and Instagram.